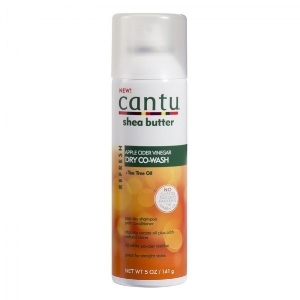 The Cantu Refesh Dry Co-Wash is made with apple cider vinegar, tea tree oil, and Shea butter. This will be my first time trying a dry co-wash, but for the days I am on the go this seems like a great option. The product is supposed to "bring your look back to life" all while giving your hair the moisture it needs minus the residue! Oh, and I MUST share this men's line product from Cantu! I picked up the Cantu Shea Butter Beard Oil for Si. He is going to try it out and we will do a video and review on our joint brand, Our Elevated Journey! Another product I am excited to try is the Luster's Pink She butter Coconut Oil Leave in Conditioner. I already use the regular shampoo and conditioner from the Luster's Pink line, and I love it because it leaves my hair feeling so soft after I wash it! Even thought this will be my first time trying their silkening leave in conditioner, I do have high expectations and will be sure to check back in over the next few weeks to let you know my thoughts on it and the Cantu Dry Co-Wash!